There’s just something about palm trees swaying in the gentle breeze and sunshine warming your face as you’re surrounded by Christmas decorations. That’s how the holiday season feels here in Florida: it’s a juxtaposition of endless summer and Christmas around the corner. Nowhere was that feeling for prevalent to me than Universal Orlando during the holidays. Universal is known for being a little bit cheeky and straying from tradition, so you can expect holiday celebrations full of fun and mischief. I walked away ready to decorate my entire house and start blasting the Christmas music because I was so inspired by everything I saw and experienced there. From Christmas at the Wizarding World of Harry Potter to encounters with the Grinch himself, it feels impossible to leave Universal Orlando without feeling the Christmas spirit. Whether you’re looking to escape the cold with some theme park fun or you live nearby and are wondering whether it’s worth it to brave the crowds for a visit, I’ll share with you the top things that make the holiday season at Universal Orlando magical. Seuss Landing in Islands of Adventure is one of the most family-friendly spots in the entire theme park. It has lots of kid-friendly rides and the bright colors will entrance babies and toddlers. It’s even more special at Christmastime as it transforms into the home of “Grinchmas” in all of its holiday decor glory. You can catch The Grinchmas Who-liday Spectacular, a musical which performs on the stage behind Circus McGurkus cafe, multiple times a day from November 17 through January 1. You’ll get to see a new set design which even gives you a never-before-seen look at Cindy Lou’s house. Enjoy Christmas carols sung by the Whos down in Who-ville. I really enjoyed the Grinch’s sarcasm and grumpy banter. I feel like we can all relate to his annoyance with other people on some level or another and get a good laugh out of it. I really think kids will get a kick out of it, too, and highly recommend trying out The Grinch & Friends Character Breakfast if your kids are fans of the big green mischief-maker. I myself can be kind of a Grinch in that I really am not a fan of parades. I will admit, though, that my heart grew three sizes during this parade, and I found myself with a delighted smile on my face. There were Minions, characters from Madagascar, the gang from Shrek, and even Santa Claus himself. The gigantic Macy’s balloons were an extra special touch. The music is merry, the characters are fun and mischievous, interacting with the crowd and dancing to the beat. The confetti falling to the ground reminded me of snow, and I saw little kids twirling around with arms wide open as though welcoming a coming snowfall. If you can get there early enough to reserve a place, the best spot to view the parade is across from the Christmas tree in front of the Revenge of the Mummy ride or Louie’s Italian Restaurant in the New York section of the park. The towering tree with its sparkling Christmas lights makes the perfect background for your parade photos! Any other Harry Potter geeks like me out there? So many of the books and movies depict such cozy scenes of Hogwarts and Hogsmeade during the holidays that it just feels right to see them decorated for Christmas in person. Standing in Hogsmeade village with a warm butterbeer in my hand watching Hogwarts Castle light up the night sky was one of the coziest feelings on earth. 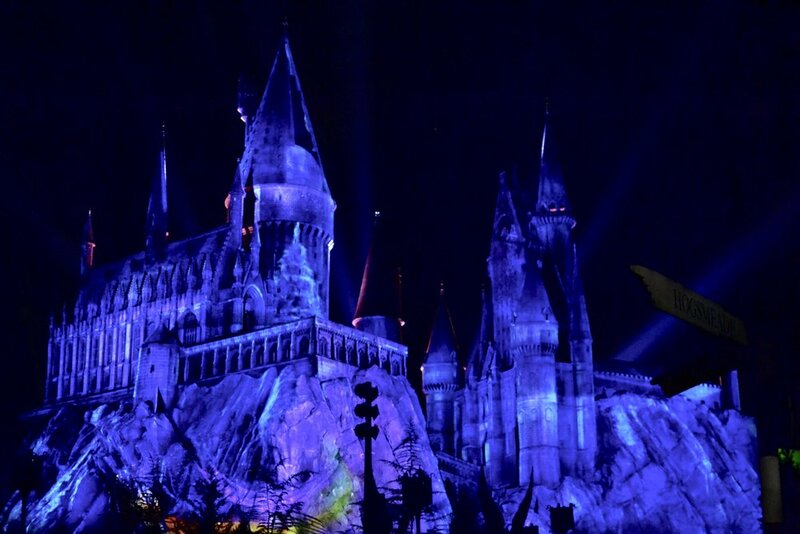 The Magic of Christmas at Hogwarts Castle, the nightly light projection show, is definitely the highlight of the Wizarding World of Harry Potter during the holidays. The seven-minute show doesn’t have any set times, but will occur intermittently throughout the evening during November 17-January 1. It kicks off with some caroling Hogwarts ghosts, then fades into scenes of kids playing in the snow around the castle. You’ll also get to see waltzing witches and wizards at the Yule Ball along with a nod to Fred and George’s Weasley’s Wizard Wheezes. The show finishes with flourish as fireworks light up the night sky in time with the music. Aside from the castle, you’ll find plenty to enjoy in the Wizarding World this Christmas. In Diagon Alley you can enjoy Celestina Warbeck and the Banshees crooning some favorite magical holiday hits, and the Frog Choir in Hogsmead will also be performing some wonderful wizarding Christmas carols. Hot butterbeer is a staple this holiday season, so make sure to grab a cup and warm your hands while enjoying the holiday decorations around Hogsmeade and Diagon Alley, each shop with its own fitting decor. The ever-present snow on the roofs of the village buildings fits perfectly with the twinkling Christmas lights, too. There are all kinds of fun holiday treats around the park, so get ready to consume massive amounts of sugar! Stop by VooDoo Doughnut in Universal CityWalk for these cute little Grinch donuts. Look for other adorable holiday-themed confections around the parks like apple strudel on a stick and reindeer cupcakes. Fun in the sun during the day, beautiful holiday displays at night - what could be better? The Holiday Celebration at Universal Orlando is one-of-a-kind and everyone in your family will find something to love. Planning your trip to Universal Orlando? Make sure you check out my tips for visiting the Wizarding World of Harry Potter!